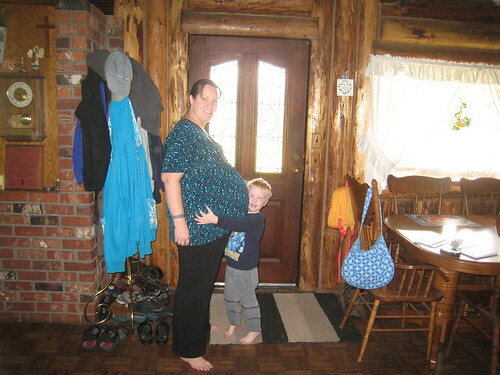 Scientific Nature of the Whammy: 38 Weeks: GET OUT! I am 38 weeks pregnant now. Also known as 9 months. Also known as comeonbabypleaseGETOUT. I am so ready. Seriously. Today someone told me that I didn't look like I was going to be able to make it 2 more weeks and I hugged them with gratitude. But... what if they're WRONG? I mean, it could be 3 or 4 more weeks before this guy decides to make an appearance. That is so not cool. Now only am I uncomfortable but I am ready to meet him. Sam still likes Danny. How shocking will it be when he comes out? I dunno. I am a Negative Nelly. I can't do anything and poor Justin comes home to Rachael everyday saying "hey do this do that can you please do..." I bet it's really awesome for him. I know it looks like I am smiling in those photos, but it's an illusion. He did a lot to help clean up the house this weekend AND mowed the lawns to get his Dad off his back about that. So, he deserves a break. I don't think either of us is ever going to get a break again though. Danny's room is not finished yet. His crib is not put together. I am starting to think about putting car seat bases in our cars and packing my bag for the birth center. I am starting to nag Justin about getting the video camera battery charged. I need to make CDs of the music I want to have to listen to in labor. I need to figure out what the heck is going to happen with Sam when it's time for us to go to the birth center! Um... yeah. I can't sleep very well. I am sore when I wake up. It hurts when I stand up. I went grocery shopping last night and pushing around a cart for an hour nearly killed me (although it didn't put me into labor stupid dang cart). Heartburn. Peeing every 10 minutes. GAH. I have a midwife appointment on Wednesday. I wonder if she will check me for progress. Not that it means anything really. I still haven't been having any contractions, but none of it REALLY means anything. He could come tonight, or stay in there for 3 more weeks. In other news, I learned from SELF magazine today that I have gained LESS weight in my pregnancy than Ellen Pompeo did. 26 lbs? Pshaw! I'm sitting pretty on the scale over here. 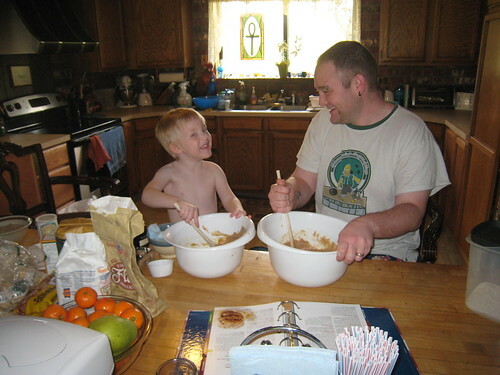 In closing, here is a cute picture of Justin and Sam helping me make cookies for my book club yesterday. Life will never be the same once Danny is born, you will have a houseful of testosterone forever!!! Oh hell, you poor thing...and no offense, but I don't feel a bit sorry for Justin, tee hee. I send hugs. Oh the aches and pains from sleeping!! I'm with you. I'm keeping my fingers cross for speedy and easy delivery for you. I am in the same boat as you, we are waiting for the hardware for the crib in the mail because we seemed to have misplaced the parts. My back is really killing me these days and I can't seem to do too much on my own. I'm actually planning on having Sara at the birth unless it's in the middle of the night in which case I do have my parents for back up. I still have to borrow a video camera for the birth. I'm only a couple weeks behind ya - and I'm routine for you! Don't forget the good ol natural method of inducement ;)!! Oh sweetie, I remember those last few weeks and I am hoping you get an early reprieve. I have been sleeping alone for a few weeks now, because the pain is really bad and I need the entire bed to be able to roll around comfortably. Kevin? Sleeps on the floor. I was hoping the full moon tonight would do something. NOPE.